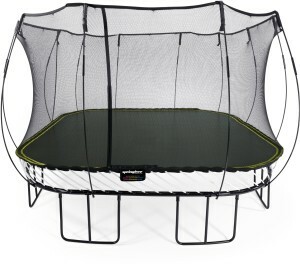 Best Springfree Trampoline - Trampoline for Me! If you’re looking to buy a trampoline, chances are you stumbled across an article about how dangerous springs can be in case of the accident. Then, further on, you probably stumbled upon the company that produces Springfree trampolines. Well, springs can be a threat. And Springfree trampolines have numerous advantages over the traditional ones – they are safer, you can actually jump higher (usually, not compared to all of them, i.e. olympic), jumping feels more natural… But the disadvantage they have is that they are really pricey. Also, my review of all of the advantages and disadvantages of the Springfree trampolines can be found here. Just to be clear on one thing – when I say “Springfree”, that means both without springs and made by a company called “Springfree Inc.” which patented this type of trampolines. If you don’t mind a little bigger price tag, this is the one that I’d definitely recommend and go with. After all, they do bear a slogan “the world’s safest trampoline”. That isn’t something to be taken lightly, right? Imagine yourself being a mechanical engineer for a moment. And imagine buying a trampoline. Now, you realize that nothing is perfect, but when your kid gets pinched by spring, you get really mad. And since you know mechanical engineering (heck, maybe you teach it?!) you decide to put the matter into your own hands and construct your own trampoline. One thing leads to the other, you become famous first in your neighborhood, then in your city, then in the country, after that… Well, then you form the company, right? Dr. Keith Vivian Alexander from New Zealand did exactly this. He’s the founder of “Springfree Trampoline Inc.” and a professor of mechanical engineering at New Zealand. So, what do you value in a trampoline? Is it safety? Is it the height of the jump? Is it leaving your kids and not worrying? Well, these trampolines answer “yes” to all of those questions! I’ll be short here, as the in-depth article is on the other page: these offer best safety enclosure on the market, are without springs (duh! ), look fantastic, have great warranty and customer service and are really durable. So, once you buy them and assemble them, everything to worry about them is over. They almost take care of themselves by themselves! When you consider what you get for this money, it is well worth it. Now, I must say that I don’t own a Springfree trampoline and I’ve never owned it. My sister, however, does. And I tried it. And I threw bricks at it and tried all kinds of crazy stuff you don’t want to try at home, but I tested it thoroughly. And I can only confirm everything that’s been said on the internet about it. It truly is a masterpiece of engineering and design. If you ask me, it worth more than what is charged, but let’s not get carried away too much. It’s enough as it is! Basically, all of them are the same, which is why the link below shows all of them in one place. I wouldn’t suggest any one in particular as it’s more a matter of dimensions. So, choose whichever you like and be sure that you won’t be mistaken whichever you take. Take good care of it and good luck! Click here to view Springfree trampolines on Amazon!